It’s Animal Health Week, and with this year’s focus on Antibiotics and antimicrobial stewardship, I’m reminded of a time I visited my family doctor years ago and read a notice in her exam room. The notice explained the difference between bacterial and viral infections, and it pointed out that antibiotics affect the former, but not the latter. She went on to make it clear that she wouldn’t prescribe antibiotics for the common cold or flu – both viral infections. 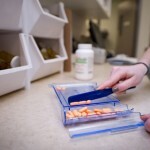 (I gathered that her patients were in the habit of asking for antibiotics in cases that didn’t warrant them.) I remember being impressed by her stand at that time, and when I think about the challenge we’re facing with antibiotic resistance today, I realize that my doctor was ahead of her time. Micro-organisms (microbes) – that is, bacteria, viruses, fungi, and parasites – have an impressive track record of survival. How do they do it? The short answer: It’s in their genes. They use them to their advantage at every opportunity – mutating here and there and sharing this trait and that with other similar strains. In doing so, they develop mechanisms that prevent medications from doing their job. The opportunity to evolve from “Joe Bug” into “Sammy-the-Superbug” comes in part when medications are used unnecessarily or incorrectly. 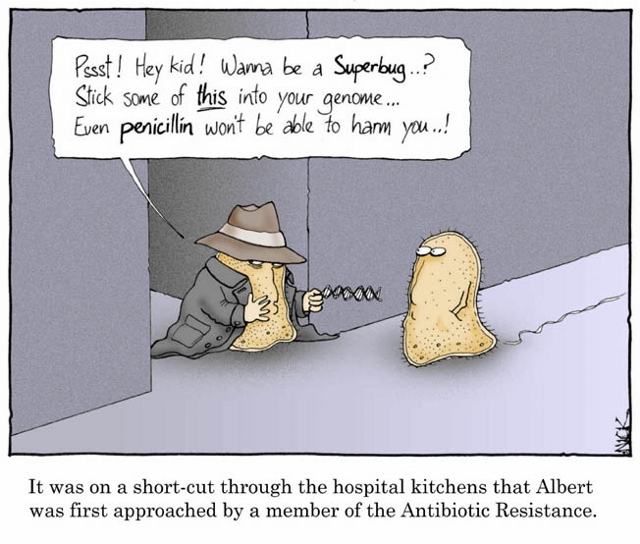 Antimicrobial resistance – that is, a microbe’s ability to resist a drug that was originally effective in treating it – is a growing issue in human and veterinary medicine, and it’s important that we all do our part to prevent it. You might be thinking, What’s the big deal? Can’t you just use a higher dose, or a longer course of treatment, or a different or stronger drug (a “bigger gun”)? The thing is, not all drugs have the same ability to kill different microbes. An antibiotic we use for a skin infection isn’t appropriate for a bacterial pneumonia, for example. And we avoid certain drugs (or higher doses or longer courses) because they can cause some pretty serious side effects. Meanwhile, a “bigger gun” is no less prone to resistance if used improperly. The responsible prescriber chooses the drug that a) best targets the suspected microbe, b) has the fewest and least serious potential side effects, c) is the most cost effective. It’s a pretty daunting thing for a veterinarian to get a lab report indicating that an infection under treatment won’t respond to the usual (and typically safest) antibiotic – and for that vet to realize that the antibiotics left to choose from are on back order (temporarily unavailable), or prohibitively expensive, or have the potential to cause something worse than the thing being treated. Aren’t drug companies developing new drugs all the time? Yes, but it takes about ten years of painstaking research and regulatory approval to bring a drug to market. Meanwhile, the resistance movement marches on; in fact, we’re reaching the point where a simple problem suddenly becomes life-threatening because the medications available to us no longer work. If you think your pet has a problem, you’re probably right. And if you’re not sure, why take a chance? 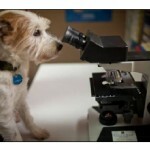 The sooner your veterinarian sees your pet (and not “Dr. 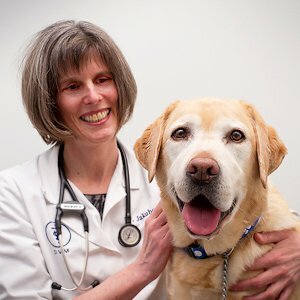 Google,” or your BFF, or anyone else who isn’t trained in veterinary medicine and doesn’t know your pet’s medical history), the sooner we can get on top of the problem and avoid unnecessary complications and expenses. Playing doctor at home is a dangerous game. Diagnoses and remedies gleaned from the Internet, family, or friends often make matters worse. And improper use of medications (see the list below) gives microbes exactly the edge they need to morph into resistant strains that can’t be defeated. 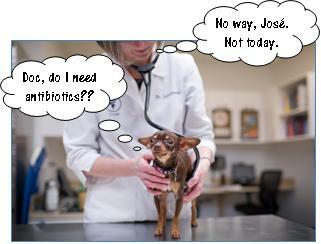 DON’T use medication that hasn’t been prescribed specifically for your pet’s current infection. 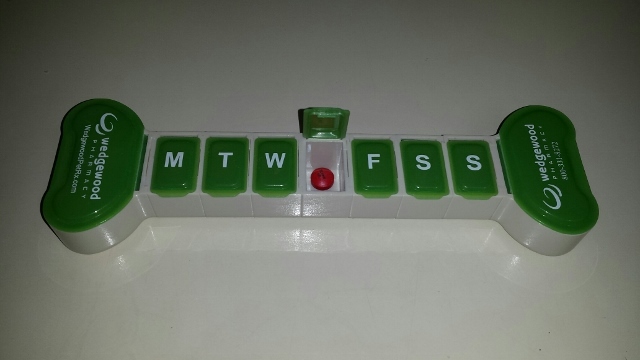 DON’T use medication intermittently for random periods. 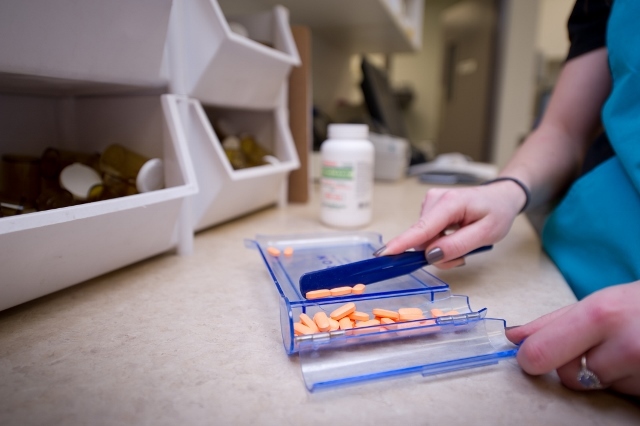 If you do have leftover meds, bring them to the clinic so we can dispose of them properly. Medications that end up in the environment provide another opportunity for resistance to develop. 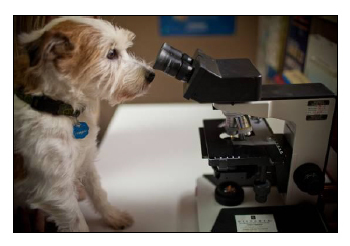 Your veterinarian is trained to make the appropriate observations and recommend appropriate tests: cytology of an ear swab for an ear infection, special staining for a corneal ulcer, cultures for certain infections to guide our choice of antibiotics, blood work if we think it will provide information that will affect our treatment plan, and so on. Testing helps tell us what the problem is (or isn’t), how bad it is, and whether the condition needs topical therapy, oral medication, or both. Medicate your pet exactly as prescribed by your veterinarian for the full course of treatment. Don’t skip doses or cut treatment short when your pet starts to feel better; there’s a big difference between feeling better and being cured. If you stop treating an infection too soon, the microorganisms that haven’t yet been eliminated will regroup and colonize anew. And every time they have that opportunity, they develop mechanisms that make them resistant to the drugs we use. It’s important to have your pet re-examined at the appointed time even if you think your pet is all better; “it ain’t over ’til your vet says it’s over.” And he/she won’t know it’s “over” until he/she has a chance to see your pet again and do appropriate follow-up testing. The role and responsibility of antimicrobial stewardship – the theme of Animal Health Week – is something we all share. Your pets’ (our patients’) lives depend on it. Veterinarians often look to Dr. Scott Weese for the latest word on this subject. 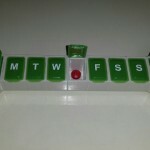 His Worms and Germs blog is worth your while.